Sorry, but C'est La Vie Boutique and Cafe, and the Penthouse have been retired. The Base Kit and furnishings are still available. Please see the next kit in the C'est La Vie Series, Oui Wee Lingerie. 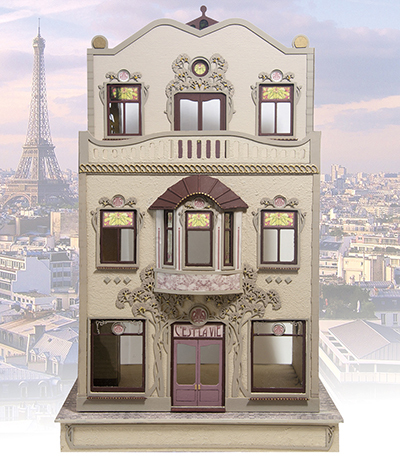 C'est La Vie Boutique and Café is a quarter scale (1:48) kit designed in the Art Nouveau style. Loosely inspired by a hotel in Prague, the exterior of C'est La Vie incorporates intricately cut tree branches and beautiful stained glass windows. The interior includes an elevator and custom designed wallpaper, flooring and ceiling papers done in the Art Nouveau style. This very special kit was a creative collaboration between True2Scale and Suzanne & Andrew's Miniatures. 1:48 Breads - 45 pcs.